Curricular Practical Training (CPT) refers to required paid internship, cooperative education, or practicum which is related to an F-1 student's field of study. The student must be registered for a course where the student will receive unit credit for the CPT training towards his/her degree. IESC processes student requests for paid internship/training authorization if required for a degree program with the academic department recommendation. CPT is approved by a foreign student advisor from IESC. CPT approval is endorsed on the student’s I-20. CPT approval will be granted for one semester at a time and for the semester the student is registered. Unpaid internships do not require CPT approval. Please see more detailed information below. Curricular Practical Training refers to required paid internship, cooperative education, or practicum which is related to an F-1 student’s field of study. The student must be registered for a course where the student will receive unit credit for the CPT training towards his/her degree. The student needs to be registered in this course during each of the academic terms in which the student intends to be involved in the CPT training. If the student plans to engage in summer CPT, the student will have to register for a course where the student will receive unit credit for the CPT training towards his/her degree through Summer Sessions. The International & Exchange Student Center (IESC) processes student requests for paid internship/training authorization if required for a degree program with the academic department recommendation. CPT is approved by a Foreign Student Advisor from the IESC. CPT approval is endorsed on the student’s I-20. "Curricular practical training. An F–1 student may be authorized by the DSO to participate in a curricular practical training program that is an integral part of an established curriculum. Curricular practical training is defined to be alternative work/study, internship, cooperative education, or any other type of required internship or practicum that is offered by sponsoring employers through cooperative agreements with the school. Students who have received one year or more of full time curricular practical training are ineligible for post-completion academic training. Exceptions to the one academic year requirement are provided for students enrolled in graduate studies that require immediate participation in curricular practical training. A request for authorization for curricular practical training must be made to the DSO. A student may begin curricular practical training only after receiving his or her Form I–20 with the DSO endorsement." "SEVIS process. To grant authorization for a student to engage in curricular practical training, a DSO at a SEVIS school will update the student's record in SEVIS as being authorized for curricular practical training that is directly related to the student's major area of study. The DSO will indicate whether the training is full-time or part-time, the employer and location, and the employment start and end date. The DSO will then print a copy of the employment page of the SEVIS Form I–20 indicating that curricular practical training has been approved. The DSO must sign, date, and return the SEVIS Form I–20 to the student prior to the student's commencement of employment." Students must have been in legal F-1 status for a minimum of one academic year (two semesters – Fall/Spring) and have maintained a full-course load. Note: students who have been reinstated after falling out of status and reentering the U.S. with a New Initial I-20 form are NOT eligible for CPT. They have to accumulate one academic year in full time status after re-entry to be eligible for CPT. 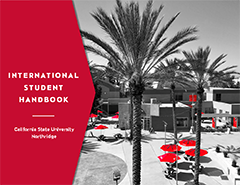 Students transferring from another U.S. institution to continue studies at CSUN in the same degree program of study at the same level may use the time spent in lawful F-1 status in the previous school to fulfill this requirement. Please submit your previous school transcript to verify your full time enrollment along with your CPT request. Note: A student transferring from an Intensive English Language Training program is not eligible for practical training. Graduate students whose program requires immediate participation in a paid internship may participate in their first semester with verification from a graduate advisor in their academic department. For the semester that students are applying for CPT, students must be enrolled for a full-course load or approved for reduced course load. Students must have a paid internship/training offer related to the student’s major area of study. Students who are participating in an internship program which is offered by sponsoring employers through cooperative agreements with CSUN are eligible for CPT. Internship Class- Enrollment in an internship course is required for CPT approval. Note: An independent study can be used for an internship course if permitted by the academic department. The number of units that can be utilized for an internship course is at the discretion of the academic department. At the recommendation of the academic department, students may engage in their internship/training full-time (20+ hours per week) or part-time (20 hours or less per week) during the semester CPT is approved. Important: Use of full-time CPT for a total of 12 months or more will cause students to lose eligibility for post-completion Optional Practical Training (OPT). Students holding other visa status who change status to F-1 must meet the one academic year and full-time F-1 status requirements. Students in study abroad programs and are requesting CPT after returning to CSUN from their study abroad experience must have been enrolled as an F-1 full time student for one academic year prior to their study abroad experience to be eligible for CPT. Students may not begin their internship/training until they have received their CPT approval from IESC! Unpaid internships do not require CPT approval. CPT approval will be granted for one semester at a time and for the semester the student is registered. Students may not change their CPT internship/training without prior approval from IESC. Students who have received 12 months or more of full time CPT are ineligible for post-completion OPT. Students can begin their training only after receiving CPT approval from IESC. The approval cannot be back dated. Course Credit Requirement: You must enroll in a course directly related to the internship and for academic credit during the semester of your internship. The credit/units you earn must be part of the required degree units of your current program of study. Note: If you drop the class during the semester, your CPT authorization will be canceled. CPT cannot be authorized after the Add/Drop deadline of the semester in which the internship will be conducted since it is connected to a course. STEP 1. Please submit the following documents, via email to iescrequest@csun.edu for review at least 3 weeks prior to the anticipated start date of the CPT. Students must be enrolled for a full-course load or approved for reduced course load when applying for CPT. CPT Request Form completed by the student and faculty member who is supervising the paid internship/training. This form can be downloaded from www.csun.edu/international. Please allow three weeks for FSA to review and process your CPT request. STEP 2. Return to IESC to sign and pick-up your CPT approval. STEP 3. Report to your company’s Human Resources Office with your original I-20 endorsed with the CPT approval. Note: Apply for your Social Security Number (SSN) if you have not done so already before reporting to your company’s Human Resource Office. See additional information on SSN on page 3 of this information guide. Please note: IESC does not require ANY fees for the services it provides to international students. No fees, under any circumstances, shall be submitted to IESC. All individuals who will be employed in the United States must have a SSN. Students who do not have a SSN must apply for one at the Social Security Administration prior to starting employment. Obtain employment authorization under CPT on I-20. Obtain an Employer Offer Letter. This letter must include the Employer Identification Number. Take the Employer Letter, along with passport, I-20 and I-94 to the Social Security Administration office and apply for a SSN. Students may return to the SSA office within three days to ask if they have been issued a number. If they have, the SSA office will provide a printout with the student's SSN. The Social Security card will be mailed in about 10 business days. Note: It may take from 3 to 30 business days to obtain a SSN. Students and their employer must complete the Form I-9 Employment Eligibility Verification which the employer retains. The Form I-9 must be updated each time you receive a renewal of your employment authorization. You may use your CPT I-20, foreign passport, and I-94 to establish your identity and work authorization for the Form I-9. For additional information regarding the Form I-9, please contact your employer. Students in F-1 status are generally subject to federal and state income taxes. Students must file a tax return on or before April 15 each year, which will determine if any of the withheld taxes can be refunded. Students are strongly encouraged to consult with a tax professional to ensure compliance with IRS regulations.